View basket “Rendel Gunboats” has been added to your basket. 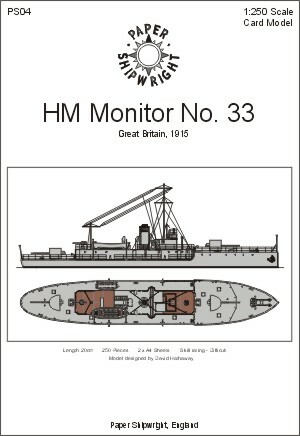 M33 was launched in 1915 to provide shore bombardment cover to troops. 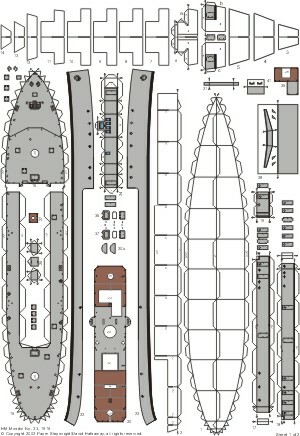 Designed to mount large calibre guns on a small hull, her main armament was 2 6″/15cm guns. She first saw action off Galipoli and gained a reputation as a “lucky” ship. She later served off Palestine and Egypt. After the end of WWI she saw action in North Russia, supporting White Russians against the Bolsheviks. Subsequent to that she was converted to a minesweeper, then a floating workshop. In 1984 her value as one of only 2 Royal Navy ships surviving from WWI was realised and M33 was bought by Hampshire County Council and is currently in Portsmouth Historic Dockyard undergoing restoration. 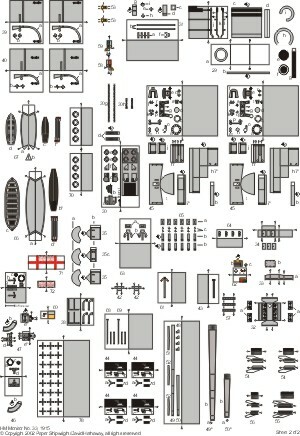 The model is available in a grey overall colour scheme or her current (and late WWI) “dazzle” camouflage scheme.